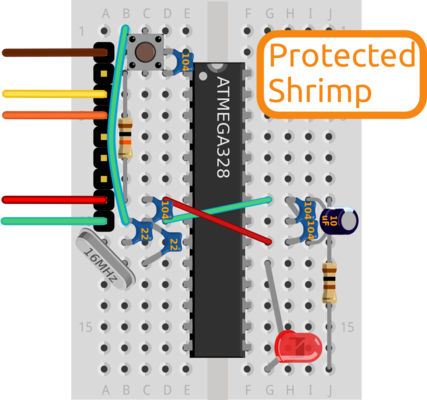 Learners who are ready to deploy Shrimp circuits in the wild, and need a Protected Build can begin by building and testing Blink, and then refer to the diagram above for the placement of additional components. For convenience, pre-bagged kits are available to order from @ShrimpingIt online. In fact, all our Shrimp Parts kits are shipped with the necessary components for the Protected Shrimp. If you do not wish to buy from us, information is provided for you to source commodity parts direct from electronics wholesalers.